NHBSR's 4th Annual Sustainability Slam was a unique opportunity for businesses and nonprofits to share their inspiring efforts to improve our communities, workplaces, and environment. The event, held at LaBelle Winery in Amherst, NH and based on NHBSR's Just One Thing Campaign, highlighted accessible and innovative ways that local companies and organizations make every day positive impacts through Just One Thing. The much-anticipated evening opened to a full house of attendees ready to learn from the inspirational stories of New England's leading change-makers. Thank you to John Benford Photography for capturing the spirit of the event in the pictures below!! 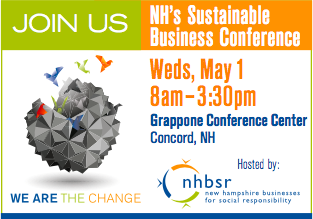 NHBSR's 2013 Conference "Your Sustainability Playbook, Shaping a Game Plan that Works for You"